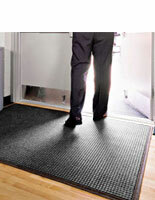 These black commercial mats make great entrance carpets for any building because they keep flooring clean. 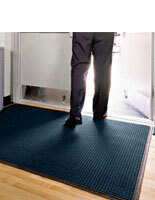 When placed at the door in a lobby, the rugs' durable polypropylene fibers will absorb dirt and water from shoes. 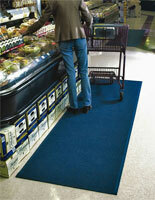 Each of the commercial mats measures 3' x 5' with a rectangular design. 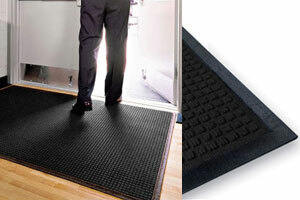 The entrance carpets also feature a non-slip rubber bottom and a raised ridge pattern for extra grip. The door mats are additionally anti-static rated at 1.2 KV, making the rugs a safe option for any office, retail store or warehouse.